A modernization of Windows NT 4.0 which brought many of the desktop improvements, including Active Desktop, to Microsoft’s Windows NT line. Four editions of Windows 2000 were released, Professional, Server, Advanced Server, Datacenter Server. Improvements over NT 4.0 include new Accessibility Options, increased language and locale support, NTFS 3.0, the Encrypting File System and Active Directory. 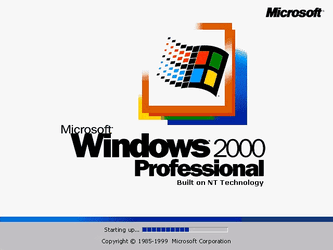 Windows 2000 was first planned to replace both Windows 98 and Windows NT 4.0 although using the NT kernel for consumer and professional editions would not happen until Windows 2000’s successor, Windows XP. Read below or select a release version to get information and downloads for Windows 2000 Professional, Windows 2000 Server, Windows 2000 advanced server and BETA copies of Windows 2000 from WinWorld. The final RTM build of Windows 2000 is 5.0.2195 which arrived with new NTFS 3.0 support, an on-the-fly Encrypting File System, new Accessibility tools and the Active Desktop, additional language and locale settings. Dynamic disks were introduced as well which allowed Windows to join disks together in a software RAID array. 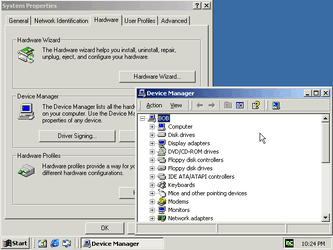 Plug-and-play support was improved compared to Windows NT 4.0. One noticeable fact right off the bat is that features from Windows 98 have made it into the Windows NT line, like the Active Desktop update, Internet Explorer 5, Windows Driver Model, Internet Connection Sharing, Windows Media Player and WebDAV support. Windows File Protection also arrived with 2000 which protected critical system files by not allowing anything other than Microsoft’s Windows Installer or Windows Update package installer modify system files. The System File Checker utility allowed users to preform a manual scan of protected system files (and optionally repair them). Windows 2000 also supported ACPI S4 hibernation, which unlike Windows 98, does not require specific vendor drivers. For system management Windows 2000 introduced the Microsoft Management Console and a vast majority of system administration tools from Windows NT 4.0 were moved to MMC ‘snap-ins’. This includes the the Event Viewer, Task Scheduler, COM+ management, group policy configuration, disk defragmenter, device manager, service control, and if installed, .NET Framework. Two versions of the registry editor exist in Windows 2000. The classic MDI-style editor capable of manipulating Windows NT permissions exists as regedt32.exe and the Windows 98 registry editor exists as regedit.exe. This is a straight port and is incapable of editing a remote registry or changing permissions. This was later updated in Windows XP. A new recovery console was introduced which can be launched from the CD-ROM (or optionally installed to disk and made available through NTLDR by running WinNT32.exe /cmdcons in Windows). This is a text-mode Windows NT (and not MS-DOS as it may look) environment. Most of what is built into cmd.exe, along with a set of NT native mode utilities may be launched from the recovery console. Features on the fun consumer side (or further brought over from 98) is support for DirectX 7.0, which is able to be upgraded up to DirectX 9.0c (Shader 3.0) with support remaining in DirectX up to the June 2010 SDK. Windows 2000 included no new stock games, including only FreeCell, Minesweeper, Pinball and Solitaire. 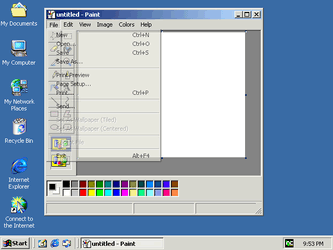 Windows 2000 included the Accessibility tools (which NT 4.0 did not) and also included some new tools. Ported over was StickyKeys, FilterKeys, ToggleKeys, SoundSentry, MouseKeys, high contrast themes, and Magnifier. Windows 2000 introduced the Narrator, which reads aloud GUI objects with the Speech API, and an on screen keyboard which works with mouse or joystick. 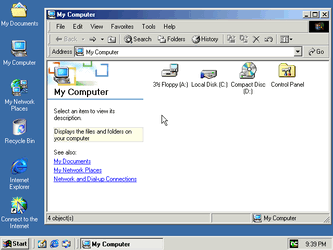 Windows 2000 introduced a multilingual user interface and can support Arabic, Armenian, Baltic, Central European, Cyrillic, Georgian, Greek, Hebrew, Indic, Japanese, Korean, Simplified Chinese, Thai, Traditional Chinese, Turkic, Vietnamese and Western European languages. Numerous locale settings are supported. All images are bootable and require the use of a virutalization platform (VMWare, VirtualBox, Virtual PC) or a real system with the ability to boot from a CD-ROM. Please note! Using this with an active, unfiltered connection to the Internet may place you at high risk for malware or other unwanted viruses. Do not use this in any form of production environment.